The M.O.D.E.M. (MUSIC OPEN DISTANCE EXCHANGE MODEL) online community has been developed by Brightonart as one of twelve European partners. 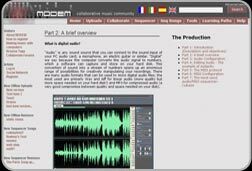 Funded by the European Comission via the Leonardo Project, MODEM is a web community which facilitates collaborative music production. MODEM continues the work started by Brightonart and some of the other MODEM partners in Musinet. The service is intended is for European student musicians who wish to colloborate to create music without needing to be in the same location. The forums provide the basis for communication where music projects may be initiated and managed. MODEM provides tools for the uploading of original tracks and mixes. MODEM is driven by the Creative Commons open source application framework CChost which has been customised by Brightonart for MODEM including localisation into Italian, Spanish and French. For more information about the project and it's developing partners please visit the project homepage.